Fine Art Photography from Muir Woods National Monument, California. In 1905, Congressman William Kent and his wife, Elizabeth Thacher Kent, bought 295 acres of forest along Redwood Creek north of the Golden Gate for $45,000. This land was spared from the logging of redwoods at the time due to its remoteness. 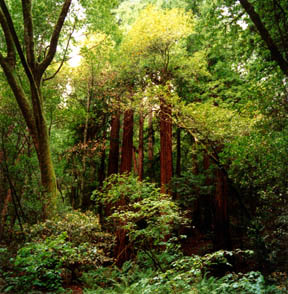 The Kent's purchased the land, noting that it was one of the last uncut stands of old-growth redwoods, and donated it to the federal government. In 1908, President Theodore Roosevelt declared it the nation's 7th national monument and suggested naming it after Kent. 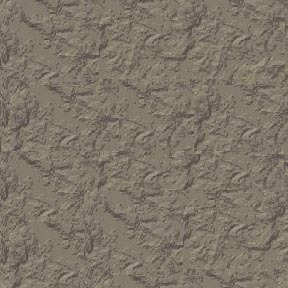 But Kent wanted it to be named after the famous conservationist John Muir. John Muir described the coast redwoods (Sequoia sempervirens) of Muir Woods "This is the best tree-lovers monument that could possibly be found in all the forests of the world". Located less than an hour drive north of San Francisco, Muir Woods, now at 560 acres, is dedicated to the preservation of an old growth forest. Redwoods are among the tallest trees in the world. 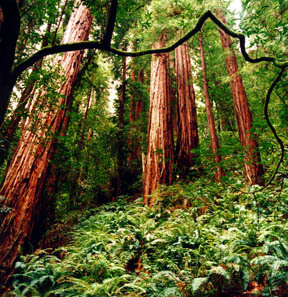 The tallest in Muir Woods is 252 feet. Most of the mature redwoods here are between 500 and 800 years old and the oldest ones are at least 1,000 years old. 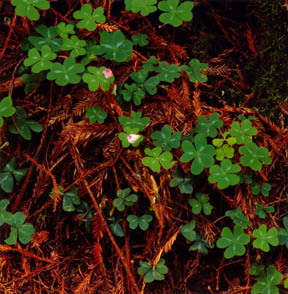 One of the unique features of this old-growth forest is the diverse ground cover: in this case, a carpet of clover-shaped Redwood Sorrel (Oxalis oregana). 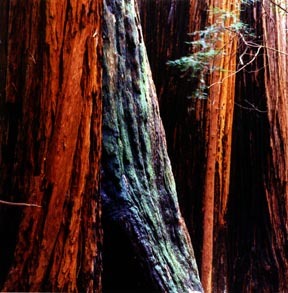 In this superposition of four adjacent redwoods, the distinct difference in hue in the one that is coated with green moss and blue-black charcoal is highlighted. 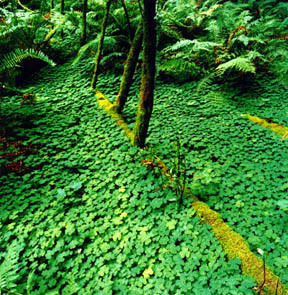 A carpet of redwood needles provides good mulch for the flowering Redwood Sorrel (Oxalis oregana).